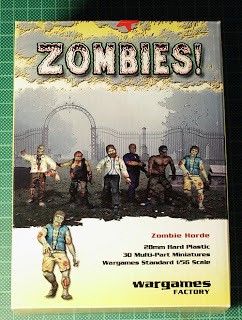 For my first all new review on this site I had a look at Wargames Factory's Zombies! box I recently got for one of my little side projects. Wargames Factory have been around for a few years now, dealing in competetively priced multi-part plastic kits. Zombies of course are a very clever release when it comes to this because nobody wants just ten or fifteen zombies, you will want a horde. Let's see what the kit is like. Let's have a look at the box first. What struck me was the kind of unusual format and how every single Wargames Factory box seems to have different measurements. The box itself, due to being made of corrugated cardboard, is rather sturdy. The cover design is rather simple but does the job by showing what you get in the box essentially and listing the contents. The picture isn't of too high quality but it's somewhat atmospheric and I like the evocative and pulp-y font of the box title. The sides and the back of the box display another sample picture, assembly instructions (text only) and recommended modelling supplies. These texts feature something I've never seen before - a whole host of typing errors on a miniatures box.Hardly a sentence without missing spaces or small typos. It almost seems like the box designer having written those whilst getting chased by zombies himself. I was very surprised. 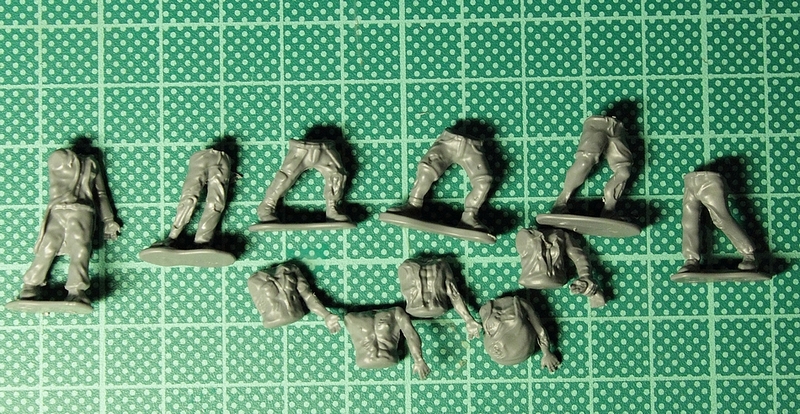 Each sprue holds parts for six zombies along with some extra bits for a total of 30 zombies per box. Five pairs of legs, seperate from five torsos, one full zombie body with labcoat/trenchcoat/smoking jacket or something like that. Each of the torsos comes with the left arm cast on. The left arm is to be chosen from one of the eight single arms from the sprue so you basically get two additional arms. When choosing take care that the sleeves on the right and left arms match up even though there always is the possibility of ripped off sleeves of course. Furthermore there are nine heads on the sprue for further variety. Stylewise all the zombies have a modern look, fitting for the 20th century (second half rather than first half) up into the 2000s or futuristic settings. One notable thing is that there are no bases included in the box. The legs come with cast-on stands instead. The sculpts are very detailled and the casting is crisp enough (could be better though, especially on the heads). The hands are well sculpted and defined but can be a bit fuzzy at times due to tiny mold lines around the fingers. Speaking of mold lines - about half of the heads are on the sprues in a way that makes the mold lines run right across the face. This is something you don't see too often and if so it's for reasons of casting (like enlongated heads or something) but I can't really see a reason why they did this in this case. The arms are pretty nice. One is sculpted so it could hold an object in hand but even using it as it works pretty well. The Zombie will just look like he's giving everybody a thumbs up. The legs definately imply that these are zombies of the shambling kind although some look more agile and aggressive in stance. Here is one sprue worth of zombies built. What I noticed during assembly is two things: First, some of the torsos don't fit onto all of the pairs of legs very well. Especially of the "fat guy" one I had to shave off a millimeter or so to make it fit. The heads have ball joints at the ends of the neck but half of the torsos don't really have very deep holes where the heads should go so you'll also have to cut or file around on the necks a little. Of course with zombies you don't really have to obey to the dictate of 'natural' poses because it's the unnatural behavior of zombies that defines them more or less. In the picture above you got a comparison shot with some Games Workshop models which sows that the scale of these zombies is true 28mm rather than the heroic kind. 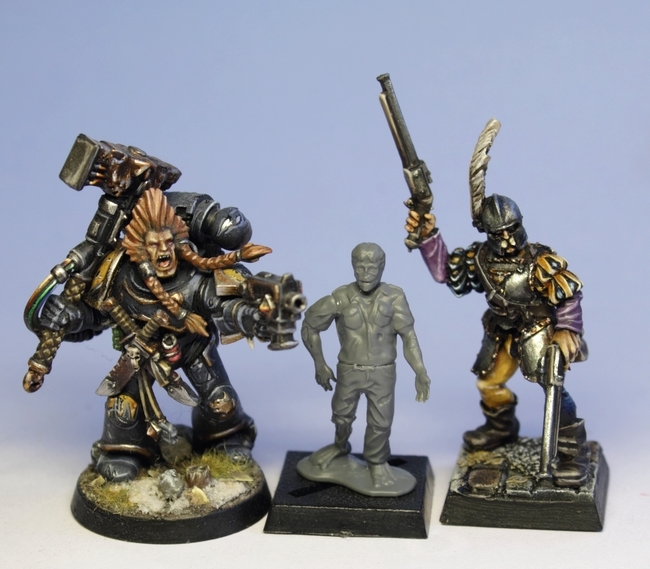 The models measure exactly 28mm from foot to eye level. I didn't have any at hand at the time of the review but I don't think that these would mix well with stuff like GW's zombies in terms of bits swapping. Now let's get to painting these brainsuckers. Despite the lack of too crip details, I had a good time painting those models. For some reason I had much fun making up weird outfits for the zombies. Especially the bald guy with the severed foot in his hand borders "Batman villain" in terms of outfit. 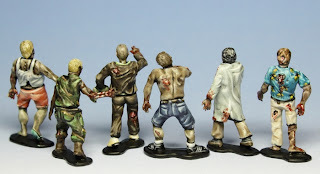 Painting the hawaiian shirt on the blonde zombie was fun as well. I thought that his face looks very reminiscent of the aliens in They Live so I painted him to have really nice hair along with the upsetting face which I always found to be the most striking contrast of these creatures. As I said, the details lack a bit definition so blacklining is really helpful on these models whilst washes and such don't work as well as one would think. So let's wrap this up - Wargames Factory give us a good mix of looks for male zombies. The sculpts aren't outstanding but they look decent. The fit of the parts isn't perfect either but works well mostly. 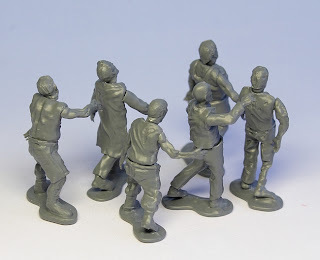 If you want to get a horde of 28mm scale zombies set up I think that these are almost essential because you get a good number of modern-day zombies (30) for around 15.00£. 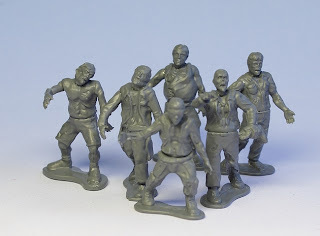 I suggest adding other zombie miniatures as well like Studio Miniatures', Heresy's or Hasslefree's very fun zombies ranges just for added variety or try combining the bits from this kit and other 28mm scale plastic models. Welcome to the new Battle Brush Studios!